I’m a big fan of Tim Burton’s work. For me, it almost always has just the right mix of quirkiness, humor, and a touch of something magical or unexpected. And before I ever recognized his name, it was the Burton-directed 1988 film, Beetlejuice, that started me on my lasting path to fandom. For those not familiar with it, Beetlejuice is a slightly dark comedy centered around the Maitlands (played by Geena Davis and Alec Baldwin). A married couple living in an idyllic country town, when they die together in an accident, they're completely confused about how to deal with being dead. Trapped in their beloved old farmhouse, their frustration hits new heights and things get even more complicated when a new family, the Deetzs, move in. After failed attempts at scaring away the newcomers, they eventually turn to self-proclaimed “bio-exorcist” Beetlejuice (Michael Keaton) to help them drive the Deetzs out. There are so many things that have made this movie an enduring favorite of mine, and the wacky characters are a huge part of that. The cast does so much right, even those who have very little screen time. A perfect example of this is actor J. Jay Saunders, who plays a moving man in a brief scene. The uninterested, blank stare that he gives Catherine O’Hara (as Delia Deetz) when she makes a comment to him makes me laugh every time. Speaking of O’Hara, I adore her role as Delia, along with Winona Ryder’s (as Lydia). Keaton, as Beetlejuice, is great too, and whomever decided to cast him for this role made the right choice. Delia and Lydia are standouts for me though. Delia has been dragged to the countryside by her husband, Charles (Jeffrey Jones), a businessman in search of some respite from the frantic pace of life in the big city. Delia literally makes it loud and clear that she’s only barely tolerating the move, and has brought her interior decorator friend, Otho (Glenn Shadix), along to help her “renovate” the farmhouse. A pretentious metropolitan who fancies herself a serious and very talented visual artist, I love the way that O’Hara plays up Delia’s “woe is me; my life is brimming with difficulty” attitude, and her absolute impatience at having to compromise with her husband. 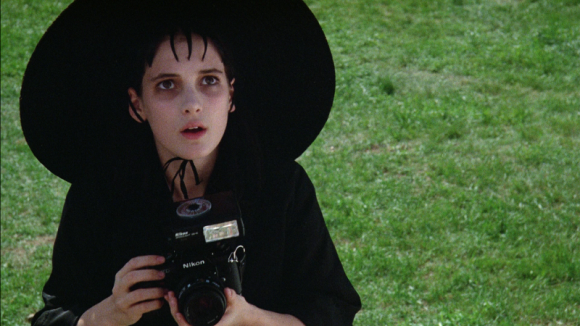 Lydia (Winona Ryder) looks like she's seen a ghost...or two. Beyond the cast, the little details in the film add so much too. Burton sets up the Maitland’s town as the quintessential sleepy little community, complete with a covered bridge and an old-timer barber who sits on the porch and rambles on with stories about the past--whether someone is standing there listening to him or not. And of course there’s the town busybody, who meddles in the Maitland’s affairs not only before they die, but afterwards too. In true Burton style, the set, costumes, and props all help add to the eccentric ambiance. While I couldn’t pick a favorite from amongst those, the handbook that the Maitlands receive after they die gets me every time, with its matter-of-fact title and optimistic 50s-style artwork on the cover. After all, who hasn't wished that some of the more monumental times in one's life (or in this case, death) came with an actual instruction book? Having trouble with the afterlife? Please consult your manual. No film would be complete without a soundtrack, and frequent Burton collaborator Danny Elfman did the music score for this one. I can’t imagine any other music fitting without his trademark style. It adds another layer of levity so that a movie that spends a lot of time dealing with the subject of death is much more of a comedy, and only the faintest sliver of anything that could be considered horror. I could go on about all of the little things that give Beetlejuice its unique blend of nuttiness and charm, but that ruins the fun of discovering most of it for yourself. I think it's safe to say that it's one of those films that's achieved--or has at least come very close to--cult status, spawning an animated TV show, a special attraction/show at Universal Studios in Florida, and a huge collection of fan art and film-inspired Halloween costume photos when one searches the movie title online. If any of that isn't enough to convince you to give it a chance, let me just say that even after watching it time and again over the years, it never fails that something new will jump out at me. Or, to go straight to the source and paraphrase the "ghost with the most" himself, "I've seen (Beetlejuice) about 167 times, and it keeps getting funnier every single time I see it". * Several of the cast members have worked with Burton on other films, including Ryder, Shaddix, and O’Hara. Both Shaddix and O’Hara teamed up with him on 1993’s The Nightmare Before Christmas; Shaddix voiced the Mayor of Halloweentown, and O’Hara was the voice of the characters Sally and Shock. Most recently, both Ryder and O'Hara lent their voice talent to characters in Burton's Frankenweenie. * Beetlejuice won an Oscar in 1989 for Best Makeup.